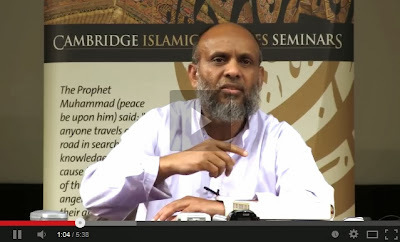 Cambridge Islamic Sciences: Hadith, Doubt and Orientalism - What is the Reality? Doubt has been cast upon the corpus of Hadith by many orientalists as well as some (modernist) Muslims. It is not uncommon to hear that "the Hadith were only written down over 300 years after the death of the Prophet (SAW) so they are not reliable". Unfortunately, many well-intentioned Muslims also fall into this type of thinking because they have no real idea or understanding of the history of Hadith and the sophisticated methods of verifying and preserving Hadith - both in text and in meaning. The science of Hadith is truly one of the most advanced and highly developed sciences in the history of mankind. Yet many of us are confused because we are unaware of this science and we do not understand the technicalities of the subject. There is no doubt that the main reason why people cast doubt upon the Hadith is because they have learnt or heard things from improper sources. Even if one does not actually doubt the Hadith, they may have found themselves in situations where they could not defend the Hadith when it has been attacked. There are also situations where people may think some Hadith to be irrational when they are not. All these situations arise from a lack of correct understanding on the subject. 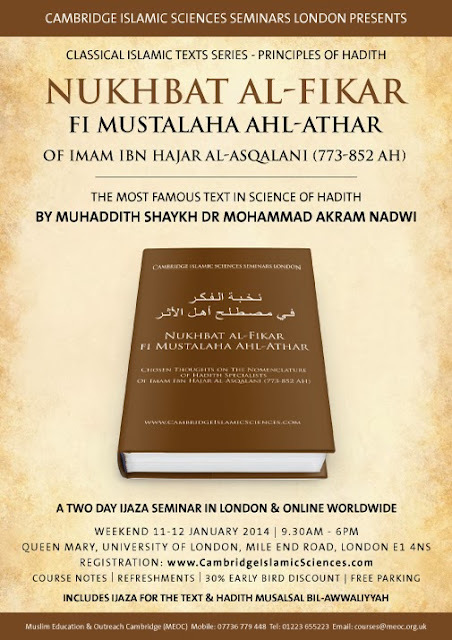 The seminar coming up this weekend on the book Nukhbat Al-Fikar of Imam Ibn Hajar Al-Asqalani (on the Principles of Hadith and its Classification by Hadith Experts) explained by Muhaddith Shaykh Dr Mohammad Akram Nadwi will demonstrate the reality of misinformation and misunderstanding of Hadith in a practical way through selected examples from both major and minor Hadith collections. A unique and priceless opportunity to learn straight from a Muhaddith to gain a clear understanding of the amazing science behind the collection, preservation and study of Hadith. Only one day to go for this spiritually uplifting and intellectually liberating weekend seminar - please sign up immediately. Please see video below for a short introduction. If this is the first time you are coming across this course and you found the discounts ended then please email courses@meoc.org.uk for a new discount code.